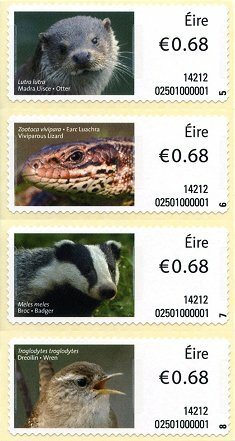 Following the long Irish Animals and Marine Life definitive series started in 2010, in2014 An Post issued the fifth series dedicated to showing, protecting and promoting Ireland's biodiversity. The new phase includes 8 photographic pictures featuring different animal species living on the island and its surrounding waters. The series could be obtained from July 31st 2014 (14212 is the ordinal date, in the format YYDDD - 14 for the year, and 212 the day number of that year, counting January 1st as day 1). 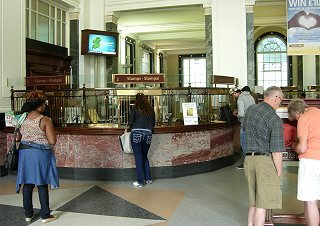 As usual, on the issuing date, only some of the counters in the Dublin GPO (images below) had the rolls with the new designs. 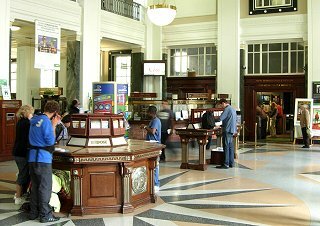 From that date, the new rolls were distributed and used at all post offices across the country equipped with the SOAR (Stamps On A Roll) franking system. 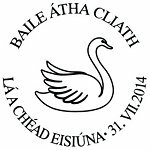 The manufacturer of the rolls of labels is the Irish Label Art Ltd. company, using designs by Zinc Design Consultants. The labels are sized 56 x 25 mm. and have perforations around the four edges. They are manufactured using thermal self-adhesive paper, with three vertical phosphorescent stripes. The 8 designs appear consecutively on the rolls. The series is manufactured in three different formats. 1. In the form of rolls of 600 self-adhesive labels with the pre-printed design, the country name, and upright sequential numbers (going from 1 to 600) in the lower right corner. These rolls are used for the printing of variable value stamps in post offices equipped with the SOAR system (image below, left). In the post offices, the impression is made using an Epson TM-J7500 thermal printer, and done at the time of purchase. It is possible to print ATMs with different face values and shipment types, according to the system options and customer needs. Below the face value, the printer prints the date of purchase, in ordinal format, (14212, first day of issue, on the pictures), a unique identifier code for each stamp including the number of the post office and the device, and operational control numbers. It is also possible to include text indicating the shipment type ('StandardPost' on the right image). 2. The series has been also manufactured as two strips of four self-adhesive stamps, including all the information preprinted by offset digital (HP Indigo). 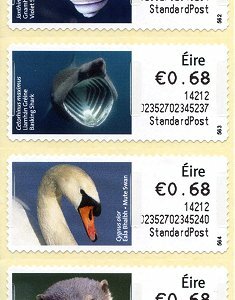 The information in the right block is fixed and identical on all the stamps - The unique face value (0.68 EUR - current basic rate for domestic mail - see the table below), the date of issue (14212 - the first day of issue), and the usual 11-digit code below (02501000001). Only the upright numbering is different for each design, sequential and going from 1 to 8. These stamps are sold by the philatelic service (image below, right), and were also used on the official first day covers. 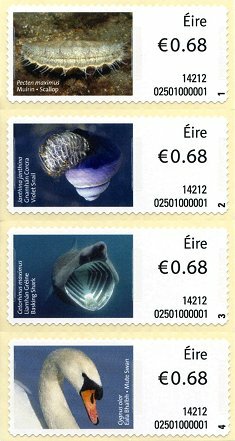 The fifth phase of the Irish animals and marine life series features five designs dedicated to marine life -the scallop (Pecten maximus), the violet snail (Janthina janthina), the basking shark (Cetorhinus maximus), the mute swan (Cygnus olor) and the otter (Lutra lutra)-, as well as the viviparous lizard (Zootoca vivipara), the badger (Meles meles) and the wren (Troglodytes troglodytes). 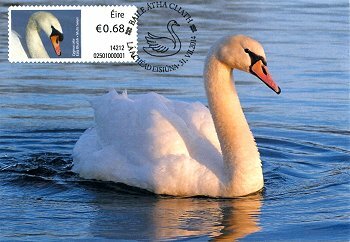 For this series, the philatelic service prepared a commemorative postmark dedicated to the mute swan, one of the animals depicted in the series. (3) Finally, the series will be also manufactured in rolls of thermal self-adhesive labels to be used on various months after the initial release, by the Wincor Nixdorf postal kiosks. Unlike the rolls used in the post offices, these rolls do not include the preprinted upright numbering. 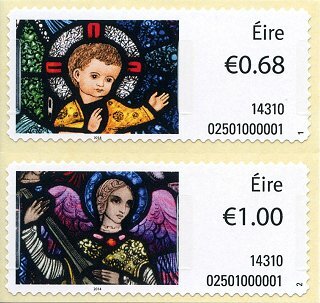 In 2014, the new An Post special series for the Christmas season is made up of one self-adhesive stamp for domestic mail, issued in booklets of 26 stamps, and two new designs for the SOAR (Stamps on a Roll) format (right image, detail of the first day cover). The first day of issue for all these stamps was November 6th 2014 (14310 is the ordinal date, in the format YYDDD - 14 for the year, and 310 the day number of that year, starting with January 1st as day 1). The series was designed by Vermillion Design, a Dublin based graphic studio. The two designs for the SOAR issues feature details of stained glass windows created, or inspired, by the work of Harry Clarke (1889-1931), Ireland’s greatest stained glass artist. The rolls of labels are manufactured by Label Art Limited on self-adhesive paper. The size of the labels is 56 x 25 mm., have perforations around the perimeter, and three vertical phosphorescent stripes. 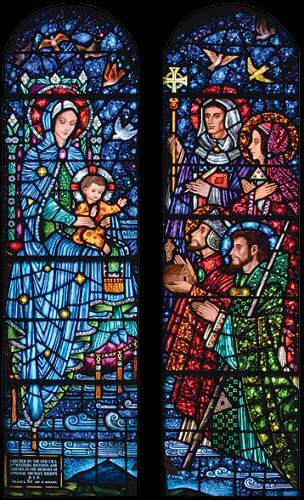 The first image features the detail of a stained glass window, 'The Adoration of the Magi', in St. Patrick's church, at Newport, County Mayo (below). This two-lights window was created, in 1971, by Harry Clarke Stained Glass Ltd., a company that continued the work of the artist after his death. 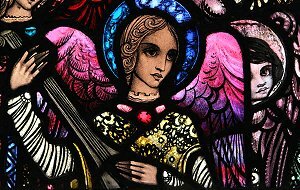 The second design 'Adoration of the Magi' is a detail of an angel with a lute, in one of the windows, and designed by Harry Clarke for St. Patrick's church, in Millstreet, County Cork (right image and below). (1) Rolls of 600 self-adhesive labels, with only the two pre-printed designs, appearing alternately. 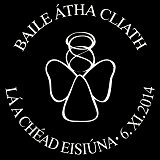 The country's name -Éire- in the upper right corner, and the corresponding sideways numbering from, 1 to 600, in the bottom right corner. These rolls were used, during the Christmas season at all the post offices equipped with the SOAR system, for the printing of variable value stamps or ATMs. 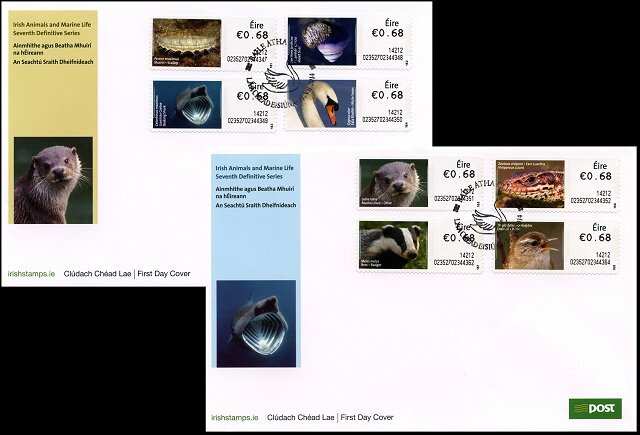 According to the needs of the customer, the postal staff issue the ATMs with the required face value (0.68 EUR on the stamps below), the date of issue (14310 in the images, the first day of issue), and a 14-digit code unique to each stamp. Depending on the option selected by the postal employee, it may also include the shipment type (StandardPost, RegisteredPost, ExpressPost, ...). In total, 3,700,000 labels were manufactured with this format. (2) Self-adhesive stamps, sold by the Philatelic Service in the form of strips of two mint stamps were also used for first day covers. These stamps include the face value, date and code, and are pre-printed by digital offset (HP Indigo). These stamps show only 14310, the first day of issue date, have the unique code 02501000001. 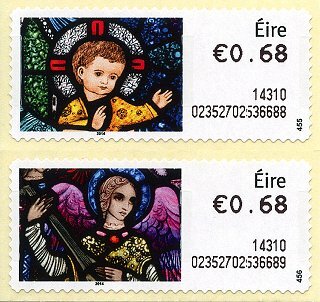 The sideways corner numbering is 1 on the stamp with the face value of 0.68 EUR and 2 for a face value of 1.00 EUR - these are the current postal rates for domestic and international mail, respectively. 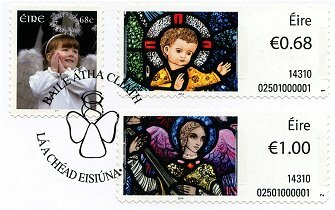 In total, 15.000 strips of two stamps were produced. The special Christmas designs are not issued by the Wincor Nixdorf postal kiosks. 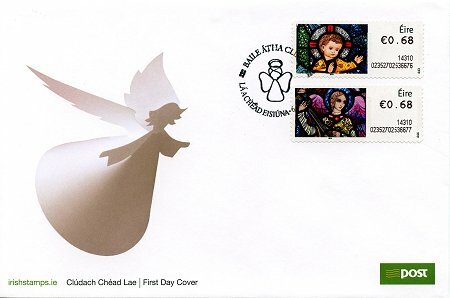 Detail of the special postmark, and first day cover with two ATMs with the basic domestic postage rate, issued on the first day of issue (14310).